He calls it, “pushing the air around,” and on record and in concert, it is Pierce’s life-defining pursuit. Uninterested in the business side of things, Pierce embodies the idea of doing what you love. His latest effort, “Songs in A&E,” is an ironic entendre that refers to Britain’s ER called Accidents and Emergencies. Part-way through the process, Pierce fell seriously ill with pneumonia and was unable to play. Jump-started by a soundtrack project for director Harmony Korine, Pierce returned to the songs of “A&E” with a keener sense for the basics, perhaps where the notes A and E come in. Finally, Pierce points out accidents and emergencies best describe his creative process. Open to experiments, his main goal is “to create a world where the listener can draw their own conclusions like a good novel,” he says. Those who have seen Spiritualized live know it is a transporting experience not limited to the deeply felt songs or the indescribable mix of blues, gospel and space rock, but rather an intuitive appreciation that is for the lack of a better word – spiritual. When asked how he conjures this on stage night after night, Pierce credits his band who share a common idea accompanied by an almost telepathic communication honed over more than a decade together. Beyond preferring smaller venues, Pierce remains vague as to the hows and whys, knowing only what he has witnessed – a practically Pentecostal rapture of sound and space and time. 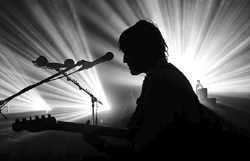 Southern Wisconsin gets a chance to see his theories in action when Pierce brings Spiritualized and their Electric Mainline tour to Milwaukee’s Turner Hall Sept 9th.